New World No 3 Padraig Harrington can complete the Paddy Slam this season according to coach Bob Torrance. After eight weeks off, Ireland’s triple Major champion insisted that it was “all systems go” for his competitive return to action in this week’s Abu Dhabi Championship. And Torrance is convinced that his star pupil will be ready to grab the green jacket in April and add the US Open to his Grand Slam collection. Torrance said: “He has the game to win on any course now and I’d seriously fancy him to win the Masters this year. “The US Open is on Bethpage Black and while everyone says it’s a monster, I know Padraig doesn’t find it that tough - though he doesn’t think it’s easy either. “Winning the Open at Carnoustie was massive for Padraig. He knew it at the time and he knows now that there’s nothing he can’t win. “He can win the Paddy Slam, of course he can. He has to win the Masters first and he just loves it there. “Everything has to be spot on at Augusta but he knows what he has to do. Someone once said to Ben Hogan that they thought the greens were a bit unfair. But Hogan just said that it depends where you hit your second shot. And that’s the attitude that Padraig has." Harrington worked with Torrance on his home range before heading to South Africa over Christmas for a month-long break, where he worked out at altitude and did heavy weights in the gym. Rated a 14-1 shot behind Woods and Phil Mickelson to pull on the green jacket at Augusta, he’s just 12-1 with William Hill to win two Majors again this season. Only Woods stands in his way and when the game’s top man comes back from injury, Harrington wants to be ready to go toe to toe and take him down. Believing he belongs at golf’s top table is Harrington’s biggest challenge but he’s convinced that he can still improve as a player. Accepting the PGA Tour’s Player of the Year award last December, Harrington said: “I think I just enjoy golf and I have an insatiable appetite to get out there and work. Every day I go out to the range, I'm enthusiastic that I'm going to improve that day. Torrance believes that Harrington can still improve his swing and plans to convince the Dubliner to use a less severe driver so he can hit more fairways. Set to join Harrington at all four Majors for the first time this year, Torrance explained: “His swing is changing all the time and sometimes he rushes the start of his downswing. He doesn’t complete it. We are trying to work on that and a wee bit through the ball and make him a bit more open through the ball. “There are a million things in the golf swing that can be improved but I really think that Padraig could drive the ball better. “We discussed this years ago and I think that the drive is the main shot in golf. If you are not driving well, your putting is not going to help you, is it? 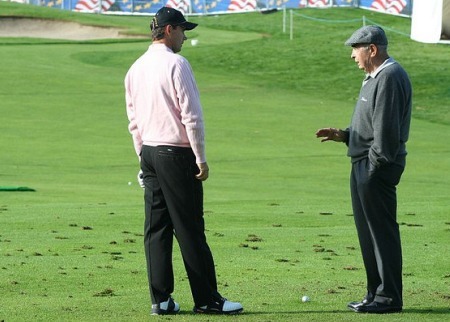 “He could definitely hit more fairways. He is using an 8.5 degree driver and I’ve been at him to go to a 9.5 degree because it is easier to flight. “A driver with a severe face and a stiff shaft is a hard combination and he’s long anyway. I honestly believe that if he goes to a more lofted driver he will gain distance. "That's why I’ve decided that I am going to go to all four majors this year. I have never been to the Masters with Padraig. "He says he wants no swing thoughts during a tournament week but everybody has got to have a peg to hang their hat on. You can’t just play with your mind blank." Swing guru Bob Torrance believes Padraig Harrington can complete the career Grand Slam and outgun Tiger Woods down the stretch in a Major.